Well today my wife found some Diet Dr.Pepper "Official Soft Drink of the Rams" cans at a local CVS store (Rams = St. Louis American Football Team). Did some quick searching online, and found that there is a whole series of these cans!!!!! I'm just far enough away from St.Louis that I'm more in the Chicago Bears or Indy Colts area.... so not sure if I'll find these others without making a long day trip.... but I will be on the lookout. There is no "drink by" date on the bottom of the cans, but the news that Dr. Pepper would be the official soft drink & bring the cans was made at the end of July. I've only found a few of the St.Louis Ram cans... no Bears Cans. OK, maybe if I can sneak away and no one tells my wife... I'll make a day trip up towards Chicago to look for the Bears cans... . maybe the next weekend towards St.Louis until I find the rest of that set also. Made a day trip and found all 6 of the Chicago Bears Cans - YEA!!! 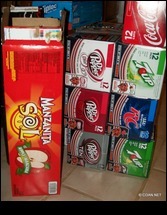 (Along with some Manzanita Sol which I didn't even know I could find the the USA... never enough Apple soda's available.) Will make another day trip in the other direction soon to see if I can get all the St. Louis Ram cans.